Identified by the National Secondary Transition Technical Assistance Center (NSTTAC), Evidence Based Practices and Predictors are research-based strategies that focus on transitioning youth. They provide guidance to transition professionals in developing and improving youth skills for community employment and participation. The NSTTAC website provides the supporting literature, research methodology, tools, and links about the practices and predictors. Evidence Based Practices are instructional methods and strategies shown through research to be effective in teaching youth specific transition-related skills related to employment, daily living, communication, academics, job-routines and tasks, independence, and workplace behavior. They can be used in a variety of settings, such as classrooms, work sites, community environments, and social settings. Evidence Based Predictors are activities, services and supports that occur during the school years that have been identified through research as being associated with higher rates of success as youth enter adulthood. The predictors provide regional teams with ideas for programs and services to build community capacity and investment in serving transition youth. 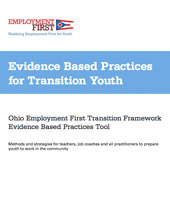 OCALI developed several tools for the Ohio Employment First Transition Framework to assist individuals and teams across agencies to understand, learn more about, and use evidence based practices and predictors. These tools provide a brief introduction to the practices and predictors and links to more information (including the NSTTAC website). Each document contains review tool to help individuals and teams identify areas of strength and to prioritize needs. Individual youth teams can use the tools to review the IEP and other agency documents to ensure that evidence based practices are individualized and included. District or regional teams can also use the tools to help plan access to evidence based predictors to improve post school outcomes. 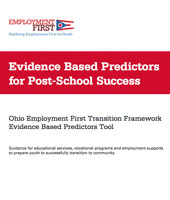 Download Evidence Based Practices for Transition Youth and Evidence Based Predictors for Post-School Success tools. Also, visit the Ohio Employment First website for more information and tools.